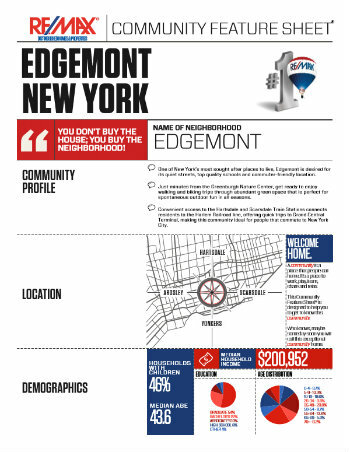 Edgemont, New York Real Estate and Community Information Edgemont is a leafy green suburban community ideally located in Central Westchester County. Edgemont is a small section of the Town of Greenburgh which is distinguished by its own award winning school district. 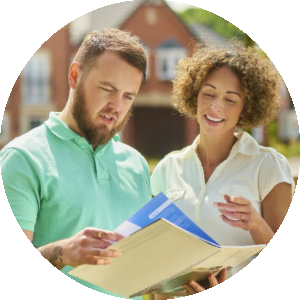 Located along the border of Scarsdale, a few short miles northeast of Yonkers just South of White Plains, Edgemont is one of the most desireable sections of southern Westchester County. Historically the Edgemont School District is within the top 3 in the entire county. There are attractions in Westchester County for just about everyone. The train ride into the Big Apple is only about 30 minutes, on average; the tree-lined residential neighborhoods are peaceful and quiet; and the shopping and dining options on Central Park Avenue are abundant. In Edgemont and the surrounding communities in Westchester County, there is a store or eatery nearby with practically anything to satisfy your growling stomach or stock your pantry. 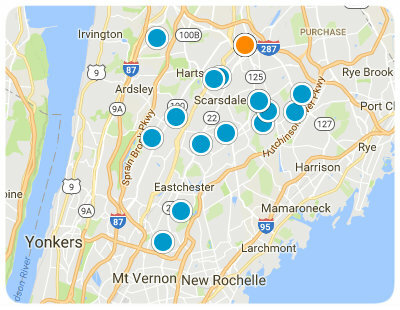 The Galleria at White Plains, the Cross County Shopping Center and the Westchester mall are just a few of the shopping options available to you in and around Edgemont. Treat yourself to some local fare at Epstein’s Kosher Delicatessen, Candlelight and many of the familiar chain restaurants, like TGI Friday’s, Cold Stone Creamery and Red Lobster in or near Edgemont. Click here for all dining options. Edgemont residents have ready access to about 18,000 acres of parkland managed by the Westchester County Parks system. This means they can play in approximately 50 parks and leisure areas throughout the county. There are hiking, biking and jogging trails, swimming and fishing waters and serene picnic locations. You can also take a roller coaster ride at Westchester County’s Playland Park, peruse captivating paintings, sculptures and several other art collections at the "Art in Parks" program, and sign your youngster up for a summer camp. In 2010 the population of the county was officially recorded as 949,113 by the U.S. 2010 census. Even with such a large number of people residing in Westchester County, it still maintains a park-like feel. One of the reasons the communities like Edgemont still have old-growth trees and open green spaces is the passion and conviction for environmental conservation of the people who call the area home. Perhaps nowhere is this spirit more noticeable than at one of the county’s impressive nature centers. 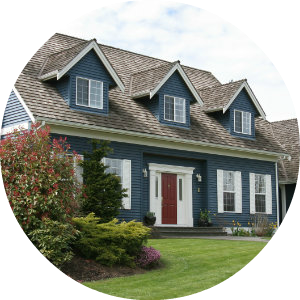 Visit the Greenburgh Nature Center and the Croton Point Nature Center see for yourself all of the wonderful features of the small, tucked away community called Edgemont. The Edgemont School District operates two elementary schools, along with a junior high school and senior high school. Click here for map and school info. 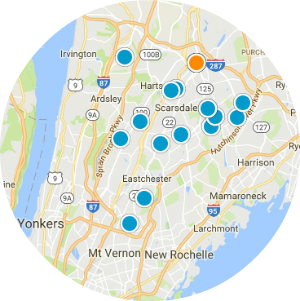 Healthcare for the citizens of Edgemont is primarily serviced via Lawrence Hospital Center, St. John's Riverside Hospital, White Plains Hospital and the Westchester County Medical Center. Edgemont offers several public transportation options to those who want or need to use it. Metro-North Railroad provides commuter train service to Westchester County; the Bee-Line Bus System and Amtrak also supply transportation alternatives.